This is a cupcake that I’ve had in the works for a few weeks – my “chocolate cake with a twist” cupcake challenge inspired me! Of course, I won’t enter my own competition, but I did want to try out my idea. I wanted a lot of chocolate and a lot of pistachios, and what I ended up with were these quadruple chocolate pistachio cupcakes. Note that these pictures were not taken with my new camera – I made these before it arrived! A Devil’s food chocolate cake made with Droste Dutch-processed cocoa powder and that has had 1/4 cup (plus a touch more) of the flour replaced with finely ground pistachios. 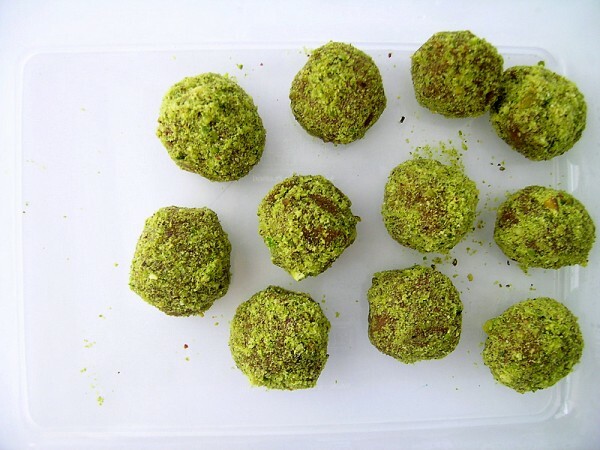 A filling of homemade Lindt milk chocolate pistachio truffles. A chocolate olive oil mousse frosting that is made from 50% Lindt chocolate and 70% Lindt chocolate. A topping of chopped pistachios and leftover finely ground pistachios. These cupcakes are not over-the-top sweet, despite how it looks with all of that chocolate! The big hit of sweetness comes from the milk chocolate in the truffle filling. However, most of the sweetness is hidden with that chocolate olive oil mousse (recipe is below). The mousse frosting is actually a real mousse that you’re supposed to spoon into glasses to serve, but I thought it’d be great as a frosting. This mousse is delicious and is definitely an adult version of chocolate mousse, so don’t waste it on the kids! 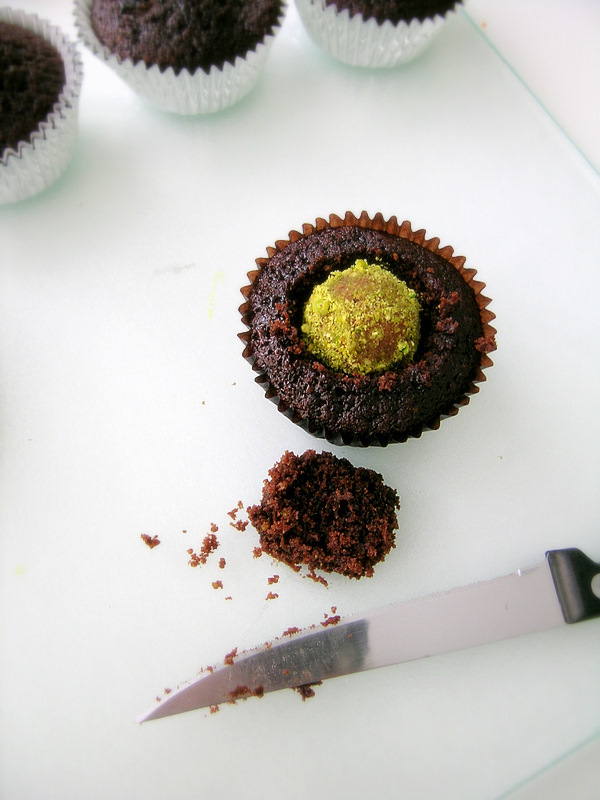 The milk chocolate pistachio truffles are so easy to make (recipe is below), and delicious on their own as well as for the filling in these cupcakes. I know I could have just filled the cakes with ganache, but I really wanted a truffle. I at first planned on putting the truffle inside the batter before baking, to see if the truffles would end up like the center of a molten cake. I changed my mind at the very last minute though, and waited until the baked cupcakes were cooled before stuffing in the truffle. If you do want a molten cake-like texture with ganache-filled cupcakes though, here’s a hint. Refrigerate the cupcakes until everything – the cake, filling and frosting – is firm (4-6 hours, or overnight is best). When you’re ready for a delicious treat, place the cold cupcake straight from the refrigerator into the microwave and turn it on for around 10-14 seconds (if you have really soft frosting, like mousse, go for the shorter time). When you take out the cupcake and cut into it, the ganache filling should ooze out like it does in a molten cake. I’ve done that with quite a few of my cupcakes! The cake recipe is from Martha Stewart. 1/4 cup of the flour was replaced with finely ground pistachios. This is one of my favorite chocolate cake recipes as it’s very chocolatey, and although it is a firm cake that holds up well for fillings and heavier frostings, it is still very moist and soft. The recipe is below. And there you have it, the cupcake I would have entered into my own cupcake challenge – the quadruple chocolate pistachio cupcakes! 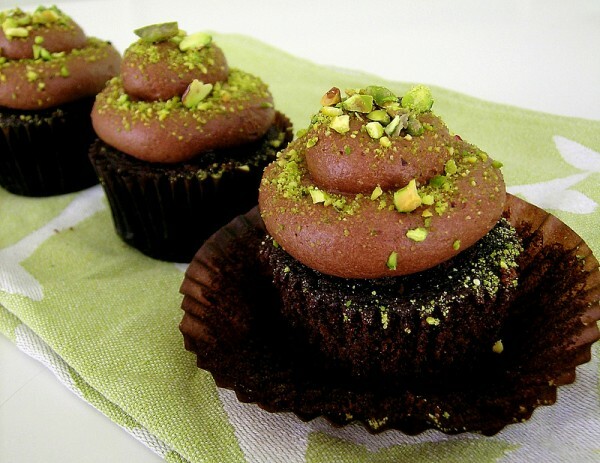 Chocolate cupcakes with a milk chocolate-pistachio truffle filling and frosted with chocolate-olive oil mousse. For the cupcakes: Preheat oven to 350 degrees. Line standard muffin tins with paper liners. Whisk together cocoa and hot water until smooth. In another bowl, whisk together flour, pistachios, baking soda, baking powder, and salt. Divide batter evenly among lined cups, filling each three- quarters full. Bake, rotating tins halfway through, until a cake tester inserted in centers comes out clean, about 20 minutes. Transfer tins to wire racks to cool 15 minutes; turn out cupcakes onto racks and let cool completely. Using the cone method, cut out a hole in the center of the cupcakes then stuff in a truffle. Cover the truffle with a trimmed part of the cupcake you cut out, if desired. 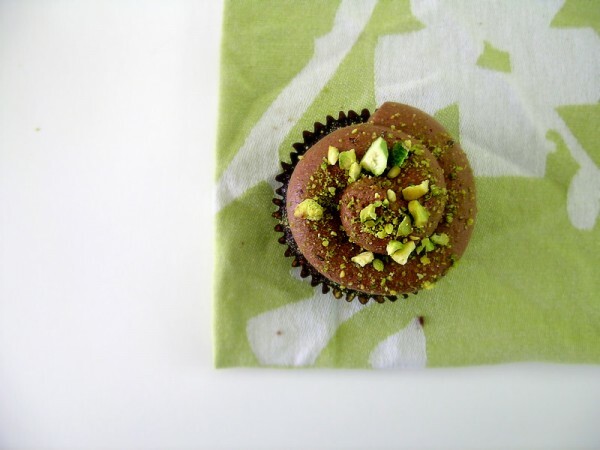 Frost cupcakes with chocolate olive oil mousse, then sprinkle with chopped pistachios. For the truffles: Melt the chocolate and cream together in a glass bowl set over a small pan of simmering water. Stir in the vanilla, then pour into a small bowl. Once cool, put in the fridge to chill for 2-3 hours. When firm, use a melon baller or 2 teaspoons to scoop out and form balls, then roll each truffle in the chopped pistachios. Chill the leftover bits to use them up. Keep chilled until ready to use. For the frosting: Place chocolate in a heatproof bowl over a pan of gently simmering water (don’t let the bowl touch the water) and stir until melted. Stir in the olive oil, then remove from heat to cool for 5 minutes. Meanwhile, in a chilled bowl using chilled beaters, whip the cream to soft peaks (I used Katie, my KitchenAid mixer to do this!). Gently fold the whipped cream into the chocolate mixture until combined. 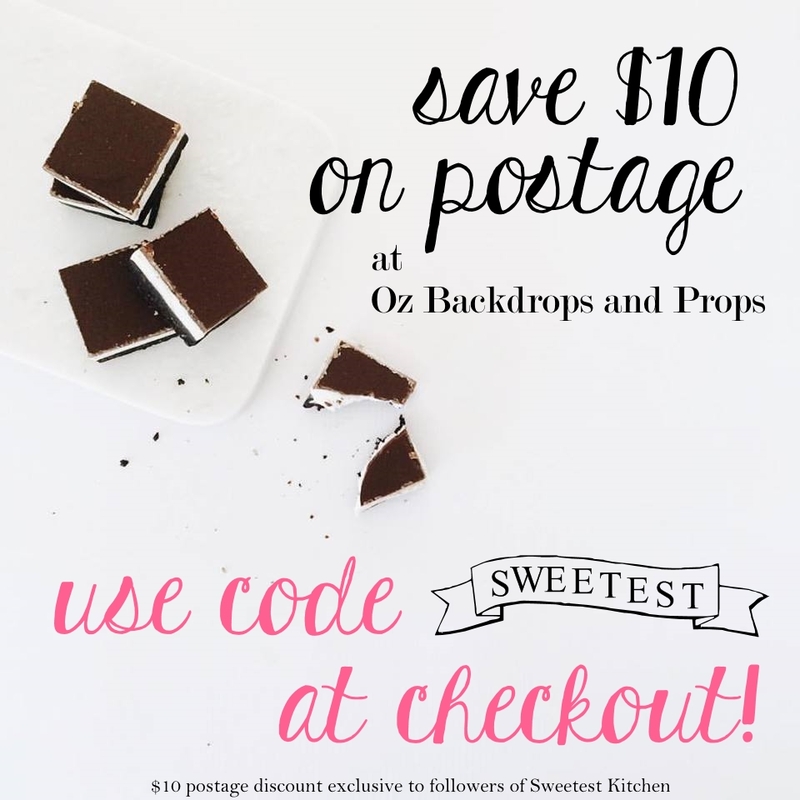 Spoon into a piping bag fitted with the tip of your choice and pipe onto cupcakes. Sprinkle with pistachios. These look awesome!!! I might just have to try them! I love the decoration on these cupcakes! How gorgeous. I’ve never been a pistachio fan, but once I had a chocolate pistachio cupcake, I fell in love with the sweet and salty combination. I have to make these! Wow! Those look ridiculously delicious!! Looks delish and delightful. Just what I was craving, chocolate, and lots of it, with nuts. They look awesome. The mousse made a perfect topping and the sprinkling of pistachios looks great. I love love pistachios. that looks wonderful. Wow these look extremely decadent. I really love how you used home made Lindt chocolate pistachio truffles. These cupcakes would have taken real dedication to put together, but the pay off would be totally worth it! love pistachios and love chocolate and you make them together very good match and look amazing well done.